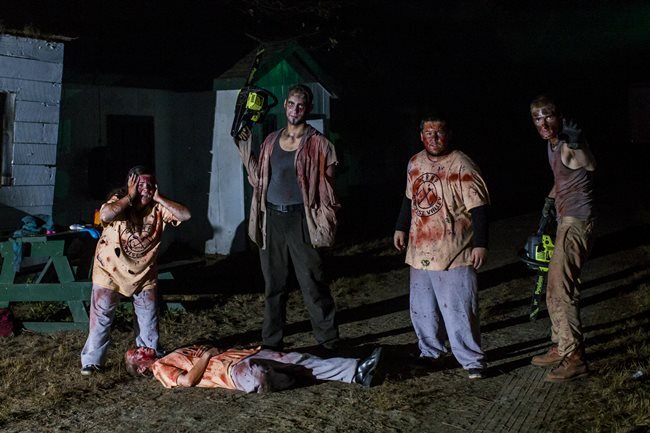 Witch’s Woods is the largest and best Halloween attraction in the Boston metro area, based in Metro West at the Nashoba Valley Ski Area in Westford, Massachusetts. While the ski lifts there are not part of their Halloween season, they have an upscale restaurant and bar, extensive carnival grounds with rides, a hay ride, a woods walk, and five other attractions, plus a costume ball and fireworks on the last Saturday of October. It’s a great destination for under-21s who can’t go much elsewhere at night! For everyone, going to an interactive Halloween destination is far more creative and interesting than a nightclub or bar. You don’t live life to the fullest getting drunk in the same place you go the rest of the year, which has hung minimal holiday decorations. Get out and try Witch’s Woods! To minimize time spent waiting in line, walk past the carnival to the far end of Witch’s Woods, where you’ll find the most popular attractions, the Haunted Hayride and Vampire Passage. Just walking the carnival grounds is a fun time, and requires no admission ticket to enjoy. There’s nothing better than doing something creative outdoors at night! The several rides and carnival games include Tilt-a-Whirl, Twister, water guns, balloon popping, bottle ring toss, and of course they sell cotton candy, candy apples, fried dough, mozzarella sticks, french fries, and hot dogs, and have a covered tent with tables to sit and eat. The main ski lodge has video arcade games, too. In this open area, wandering actors dressed as monsters, for example two Grim Reapers on stilts with glowing eyes, entertain you while you walk around. You’ll scream, then laugh, and then you can ask to take a photo with them. To each side of the path, there are 10-foot tall dioramas of a 10-foot tall Bull God and an Alien Creature. It’s a nice to take in the smells of crisp air and leaves, and if the night isn’t cloudy, you’ll see the moon and plenty of stars. Everyone’s having a great time. 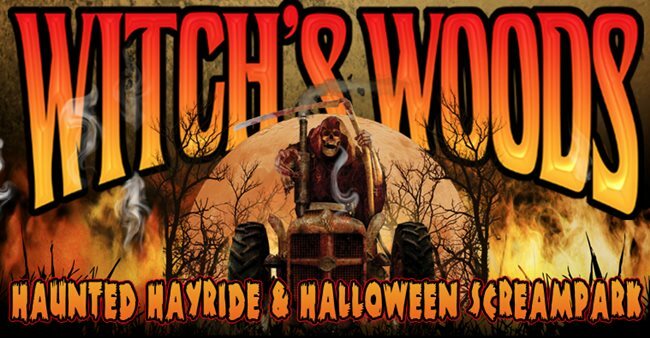 The Haunted Hayride is a tractor-pulled flatbed trailer where you sit along the left or right side. (There’s no actual hay or animals to feed.) It’s a 14-minute journey where you’re towed through the woods. Any night time spent in the woods is eerie, but then they add dioramas, special effects, and monsters rushing out to eat you, um, I mean, greet you. The hay ride changes regularly, and this year they’ve returned to the “Witch’s Woods” theme, where you pretend to be searching for a mystical book. Each hay ride gets a tour guide, who with good humor explains the locations that you pass. Her timing was good, the comedy didn’t deflate the spookiness, and she allowed long silences for us to appreciate the outdoors and feel the expectation of something approaching. Perhaps the word ‘gypsy’ should be changed to ‘witch’, since gypsies are an ethnicity — they’re from Romania — that shouldn’t be caricatured as magical and untrustworthy. The hayride features elaborate costumes and makeup, and an extensive cast of actors rushing out equally to both left and right sides. Ghouls dance around a maypole. A few plywood shacks represent the town of Ironwood Hollow, where sparks fly. We were delighted by effects where fog shoots out as if from a hose. 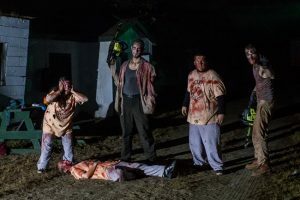 Monsters with chainsaws, an extensive cemetery with a grave digger, and a zombie prison camp called New Deadford — where you can guess what happens — form a delightful array of encounters. Hung lanterns light the trail, adding a classy touch. Actors mostly growl, but a few have short lines to say. A mishmash of themes. Zombie prison the zombies of course escape, a mob of 4 zombies rush out, on both sides. Although the witch theme gets lost quickly in the ride, your quest for the magic book makes a return with special effects towards the end. To make better use of actors, who are otherwise split exclusively to one side or other, tour guides could ask visitors to allow space for actors to climb up and onto the hay ride. The Vampire Passage is a 7-minute walk through the woods, themed like a spooky cemetery. The path is made clear by ropes to your left and right, and the ground has been cleared of rocks to stumble over. It’s delightful to experience the woods at night, with classy lanterns leading the way and spooky ambient music with ghost sounds. A guide leads you part way in and then you are left to your own. It’s dark and interesting, making good use of trees that have fallen over naturally. You’ll find dozens of mannequins, which look constructed, not store-bought. It’s great fun to guess which ones may be an actor who will jump out at you! The path features an evil clown, fog shooting out of a mausoleum, a wooden plank bridge with fog, and a unique vampire lair with hanging animatronics and a real fountain. It’s only 6 minutes’ long but the most theatrical part of Witch’s Woods, with creative makeup, costumes, and set design. They even make use of trees that have fallen over naturally, leaving their spooky roots exposed. Now that you’ve seen the best parts of Witch’s Woods, you can spend an entire evening at the restaurant, on the carnival rides, or at the other attractions. The 3D Keepers Crypt is a maze where you put on 3D glasses. Innovatively, they project a movie outdoors to entertain you while you wait in line. (The audio is not clear, so subtitles are needed.) The glasses have a prism effect, making some colors appear closer and some further away. This makes objects painted on the maze’s walls appear to pop out. The maze is basic, made of painted plywood, with some rooms (such as one where paint has just been spattered on walls) too unthemed for me. (Walking through passageways, the walls should look like passageways.) But in other places in the maze do have a patterned theme, such as bricks, a clown house, wooden panels, and cube shapes. In places, random things hang from the ceiling. The colors make them pop out in interesting ways. In this area, actors mainly try to startle you by jumping out, but some have lines to say. It’s typical, not overly worse or better, that what you’d expect from a haunted 3D maze. The Nightmare Mansion is built into the main ski lodge, which has an upscale restaurant and real bathrooms. This is also a plywood maze, but it’s been painted to look like a Victorian mansion. You’ll find a shower murder scene, a hospital theme, and a few animatronics. While there are some animatronics, and some creative old-timey objects, other places are just plywood walls with blood. We did get bunched up with the group just ahead of us. Although a few actors had lines to say, mostly they just screamed hoping to startle up. Much of the attraction had “filler” decorations of storebought cobwebs and netting. 5-minutes’ long, it was not exceptional but fun to see. The Castle is the most basic attraction at Witch’s Woods, and the one to skip if you lack time. The 4-minute long plywood maze contains mainly filler decorations such as camouflage netting and cloth strips hanging from the ceiling. However, there’s a room with ancient weapons, another with stacked coffins, and a wonderful medieval feast room with fog effects and a dinner table laid with blood sausage and a severed head on a tray. Actors mainly jump at you without a genuine role or line to say. It’s worth the maze just to see the haunted feast, which was added since last year, if the line’s not too long. The carnival grounds also contain two not-so-spooky attractions that you need no admission ticket to enter. If you’re coming with a scaredy-cat friend or small child, this is a good way to test whether they’re up for seeing the spookier attractions nearby. Horrorwood is a series of dioramas taken from the history of scary movies such as The Ring, Werewolf and Mummy, and Nightmare on Elm Street. These scenes are remarkably well designed, though static and separated from your visceral encounter by glass windows. Elsewhere an animatronic wolf pops out of a trash can and looks around. Separately, the Jack O’Lantern Jamboree are displays with 150 carved and lit pumpkins, in red and orange lighting. There’s also a stage with a prop monsters to take photos with. The carvings are excellently made and arty, mainly taken from popular culture, some of scary creatures such as The Creature from the Black Lagoon, and some with non-scary characters such as The Simpsons. Arrive early to Witch’s Woods so you can visit their Outlook Restaurant after the attractions, or before Witch’s Woods opens. 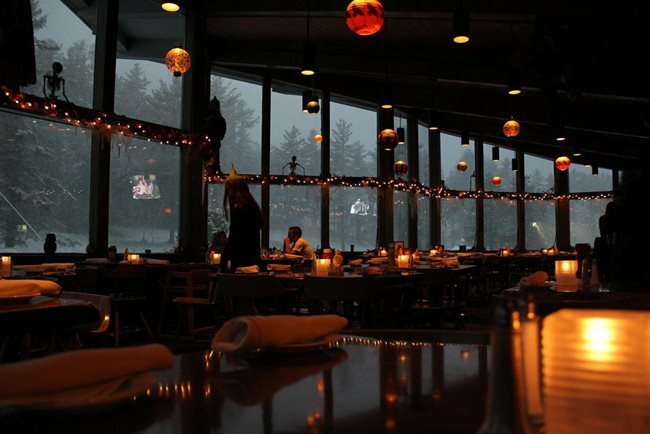 The Outlook Restaurant is open year-round, with a much larger menu in the winter, which is skiing season there at Nashoba Valley Ski Area. The Outlook has a great views of the Witch’s Woods carnival grounds, ski lift, and hills of Nashoba Valley Ski Area. It is large, with at least 30 tables and plenty of seating at the bar. Televisions are placed only at the bar, so that they don’t force themselves onto your dinner conversation. At one end, there’s a real fireplace, and you get a real candle at your table. Staff dress in Halloween costumes and you’ll find original Halloween props hanging overhead. 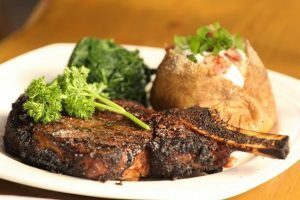 The menu offers healthy choices, but also comfort food, featuring seafood, steak, and pasta. You’ll also find appetizers, salads, burgers, and sandwiches. 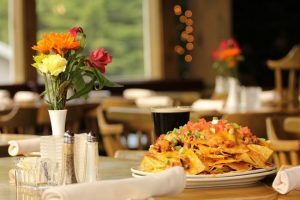 They have an extensive drinks menu of wine, spirits, coffee drinks, draft beers, and bottled beers, plus autumn specials such as hot cider and the Pumpkin Martini. They bring out bread to begin, which was welcome though unremarkable. Try their lemonade with soda water and hot apple cider. The lemonade not sicky sweet and comes with a wedge of lemon. They aren’t made on site, but are so refreshing — just what you need to rejuvenate and go back out there to the fun. This became the theme of all the foods we tried at The Outlook. They filled us up but didn’t make us feel lethargic or full of greasy regrets. For example, the New England Clam Chowder and Firehouse 3-Alarm Chili are not too rich to be eaten and appreciated. (Have you ever had a clam chowder that was just too heavy? You know what I mean.) They are served piping hot. The potatoes in the chowder have a smooth consistency, and the chili comes in a little pot covered with cheese, tomato, scallions, and warmed nachos on the side. The secret is the brown sugar in the sauce. The presentation is simple, on white plates. The Devil’s Calamari and Teriyaki Shrimp Skewer appetizers were good although standard and not so spicy. The calamari comes with hot peppers and a mild red sauce. Like scallions, the calamari bends more than chicken but is not rubbery, rather a meat that’s less dense than chicken and easier to chew. The shrimp skewers come with a ginger sauce, fresh lemon, and seaweed. The Mogul, a hamburger with Swiss cheese, caramelized onions, and mushrooms, has a powerful presentation. It’s a complete plate with a giant pickle, a thankfully separate lettuce and tomato portions. The burger has impact, having a high-grade meat with an absolutely smooth consistency, and not too greasy. If I’m going to cheat on my diet, the last thing I need is that heavy feeling in my stomach that wears me down. The Mogul instead pepped me up and kept me going. To me, who comes from a British cuisine (if one can call British cooking a cuisine) where vegetables are boiled to death, the butternut squash seemed to have too much crunch in it, and not enough spice. The french fries were serviceable and not overly fried; thus one could taste their potato goodness. The apple crisp was not for me, the baked crust portion being soggy instead of chewful, although it was served with good presentation, piping hot on a plate with cold ice cream. 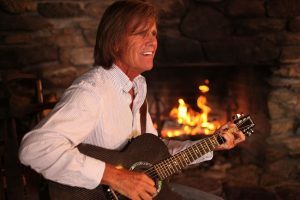 The Outlook Restaurant features live music Thursday, Friday, and Saturday evenings, and I was glad to find that it was not too loud for conversation (though you may not want to sit directly next to them). Performers rotate, but the band that I saw had a good stage presence, playing easy listening music from the 90s and 00s, playing just chords on the guitar, but varying percussion and their voices to match the pop bands they covered. It was a step up from the band you expect at a restaurant, and from the size of their song book I suspect they really do take requests to play just about any song! The Outlook Restaurant kindly permitted an interview with Adriana Machado, Head Chef and Pam Fletcher, Head of Marketing, and a former US Champion and Olympic skiier. Events INSIDER: Adriana, you’re Brazilian. How does that play into the menu at The Outlook? Adriana Machado: I start with the base and then come up with my touch, with knowledge from my background. My grandmother was Portuguese, an immigrant living in Brazil. I learned everything from her. Events INSIDER: This is a family-friendly place. How do you modify the menu for kids? Adriana Machado: It’s simple. We have a kids’ grilled cheese, hot dogs, and they love the homemade mac and cheese. It’s made with a lot of love. Events INSIDER: Do you take special requests? Adriana Machado: People, these days — you want to know what’s going into your body and a lot of people these days want to avoid soy, sodium, and gluten. Pam Fletcher: When we do private functions we get a lot of special requests. Adriana is amazing at creating meals for vegans. She’s very sensitive and always creates something special for those individuals who can’t have specific items. Events INSIDER: What is the meal that you’re most proud of? Adriana Machado: It varies from season to season. This season is the meatball season! It’s homemade. It’s like a piece of Heaven. 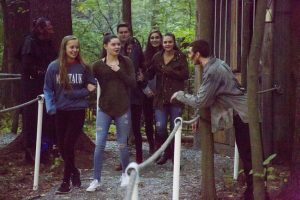 As well as hosting Witch’s Woods each fall, and The Outlook Resturant year-round, especially during winter skiing, Nashoba Valley Ski Area hosts the Sunset Tiki Bar and Grill each June to mid-September, with a Pacific island beach and swimming hole theme. The Saturday before Halloween, they’ll have fireworks at 10pm and then a masquerade costume ball. 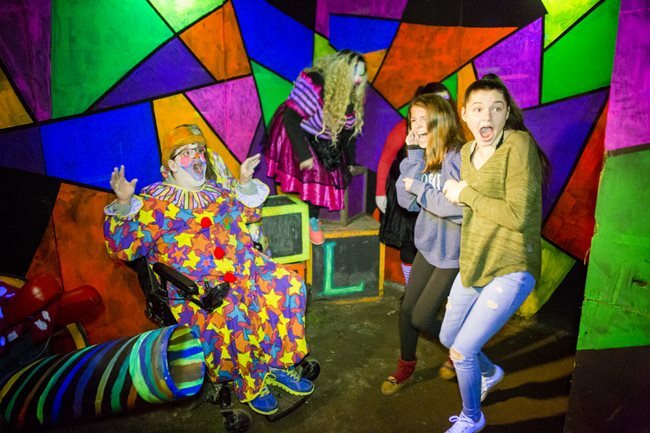 Although not every attraction is theatrical, there’s so much to do at Witch’s Woods and it’s so close to Boston. I’ll give Witch’s Woods a full 5 stars again this year. Here are some video shots from Witch’s Woods!